Birria(Spanish: [ˈbirja]) is a Mexican dish from the state of Jalisco. The dish is a spicy stew, traditionally made from goat meat or mutton, but occasionally from beef or chicken. The dish is often served at celebratory occasions, such as weddings and baptisms, and holidays, such as Christmas and Easter. It is also reputed as a hangover remedy. Preparation techniques vary, but the dish is often served with corn tortillas, onion, and lime. Traditionally, the meat is marinated in adobo spices. 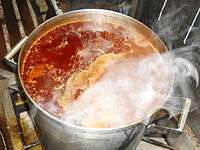 Restaurants or street carts that serve birria are known as birrierias and exist through Mexico, but especially in Jalisco and its capital, Guadalajara. Birria is an icon of the cultural identity of the jalisciences (people of Jalisco) and especially the tapatíos (people of Guadalajara). 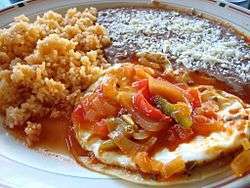 However, neighboring Mexican states have their own variations of the dish: the birria estilo Zacatecas of Zacatecas and the birria de Colima of Colima. 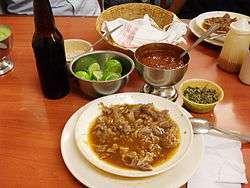 Wikimedia Commons has media related to Birria. 1 2 3 4 5 6 7 8 9 Rafael Hernández, "Birria," in Celebrating Latino Folklore: An Encyclopedia of Cultural Traditions, Vol. 1 (2012, ed. María Herrera-Sobek).